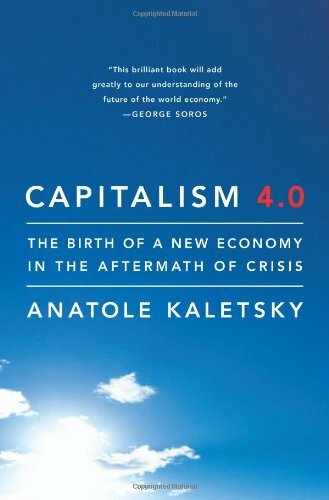 [PDF] Capitalism 4.0: The Birth of a New Economy in the Aftermath of Crisis | Free eBooks Download - EBOOKEE! Posted on 2017-12-30, by luongquocchinh. Description: In early 2009, many economists, financiers, and media pundits were confidently predicting the end of the American-led capitalism that has shaped history and economics for the past 100 years. Yet the U.S. economic model, far from being discredited, may be strengthened by the financial crisis.In this provocative book, Anatole Kaletsky re-interprets the financial crisis as part of an evolutionary process inherent to the nature of democratic capitalism. Capitalism, he argues, is resilient. Its first form, Capitalism 1.0, was the classical laissez-faire capitalism that lasted from 1776 until 1930. Next was Capitalism 2.0, New Deal Keynesian social capitalism created in the 1930s and extinguished in the 1970s. Its last mutation, Reagan-Thatcher market fundamentalism, culminated in the financially-dominated globalization of the past decade and triggered the recession of 2009-10. The self-destruction of Capitalism 3.0 leaves the field open for the next phase of capitalismâ€™s evolution. Capitalism is likely to transform in the coming decades into something different both from the totally deregulated market fundamentalism of Reagan/Thatcher and from the Roosevelt-Kennedy era. This is Capitalism 4.0. No comments for "[PDF] Capitalism 4.0: The Birth of a New Economy in the Aftermath of Crisis".